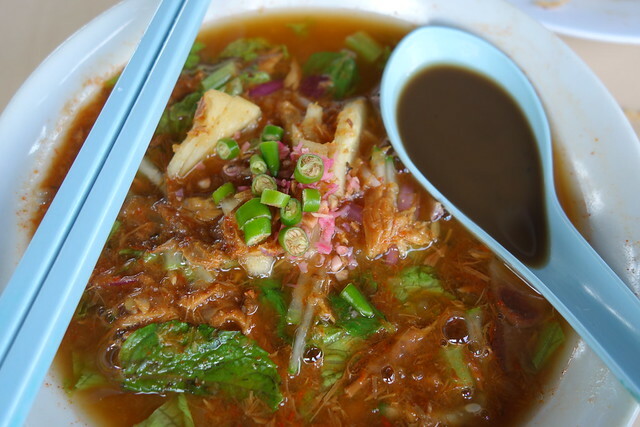 During my recent size-changing trip to Penang, I was determined to hunt down some of the best Penang Laksa on the island. Most people in Singapore are familiar with Laksa Lemak, which comprises blanched rice noodles served in a spicy, coconut-milk broth and topped with prawns, sliced fishcake, cockles, chili paste and shredded Laksa Leaves (aka Daun Kesom / Vietnamese Mint). Less commonly available in Singapore, is a piquant, tangy and coconut milk-free version known as Penang Assam Laksa or Penang Laksa. 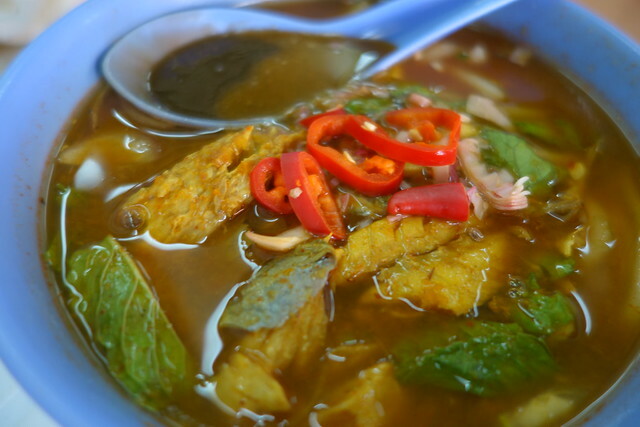 Unfortunately, we tend to get awful versions of Penang Laksa in Singapore as they often contain canned sardines instead of the traditional Ikan Kembong (Indian Mackerel). After sharing 2 plates of Penang Char Kway Teow at Lorong Selamat, V and I ordered a bowl of Penang Laksa while seated at Kedai Kopi Low Eng Hoo. Though this bowl isn't much to look at, there were generous chunks of moist Ikan Kembong in the bowl. Other toppings included fragrant mint leaves, diced Bunga Kantan (Torch Ginger Flower), sliced onion, pineapple, sliced red chili and a spoonful of Hae Ko (fermented prawn paste with a honey-like consistency). Though this bowl wasn't as spicy as I would have liked it to be, I loved the fragrance and refreshing flavour from the generous topping of mint leaves and diced ginger flower. 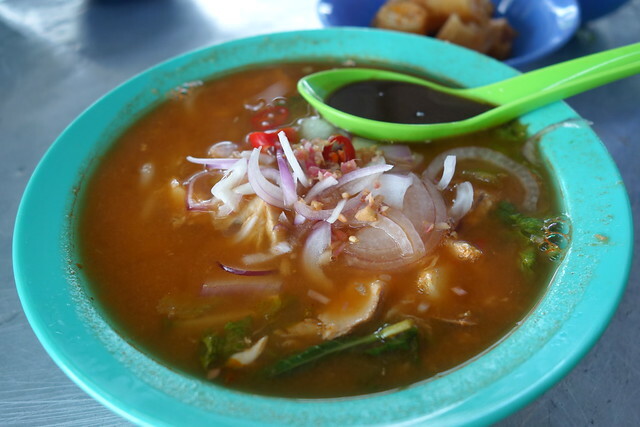 The Penang Laksa at Lorong Selamat is a Must-Try! One of my friends had recommended the Penang Assam Laksa from Joo Hooi Cafe at Lebuh Keng Kwee, where the famous Penang Chendol stall is located. This was the most tart of the four bowls of Penang Assam Laksa we had during our stay. Though it wasn't overwhelmingly sour, its fish broth base was not as tasty as the one sold at Lorong Selemat nor did it have any diced Bunga Kantan and barely had any mint leaves. I was a little disappointed as one of the highlights of Penang Laksa for me is the refreshing flavour of herbs and spices, very much like how various herbs are important in adding a fragrant touch to Vietnamese Pho. This food truck was recommended by peacecka531 on Instagram, after reading about my disappointing experience at Joo Hooi Cafe. We were told to look for a truck behind Jelutong Post Office. Located along Lorong Ipoh, this food truck was bustling with activity in the middle of a gloomy afternoon in the sleepy residential area of Jelutong. Tables had been set up along the pavement where some locals had a quick bowl of Laksa whilst most of the locals were there for takeaways. The broth here was slightly spicier than the others that we've tried and was our favourite out of the four bowls we had during the trip. The right balance of spice, sourish tang from the assam, flavourful fish broth and fragrant herbs and spices. This bowl was worth the long cab ride from Georgetown. A Must-Try if you're in Penang and have a reliable form of transport as it's near impossible to flag a cab from the street in this area. 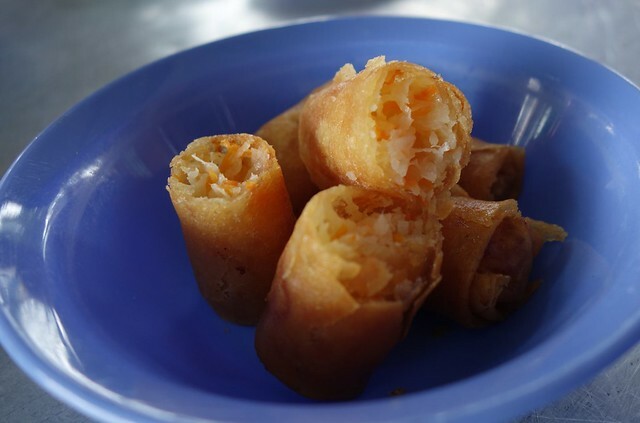 We couldn't resist ordering some deep-fried Poh Piah (Spring Rolls) to complement our Penang Laksa. The golden brown spring rolls had a lovely crisp skin and crunchy filling of shredded vegetables. I loved to eat the Poh Piah on its own and when dunked into the spicy broth. 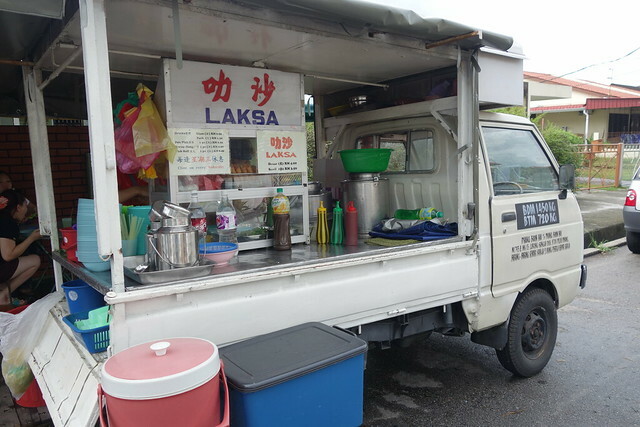 If you're having Penang Laksa from this food truck, do order some Poh Piah for added enjoyment. When in Rome, do as the Romans do. When the lady next to us ordered both the Kwan Jiang (vegetarian bean curd roll) and the Poh Piah, we had to try the Kwan Jiang too. 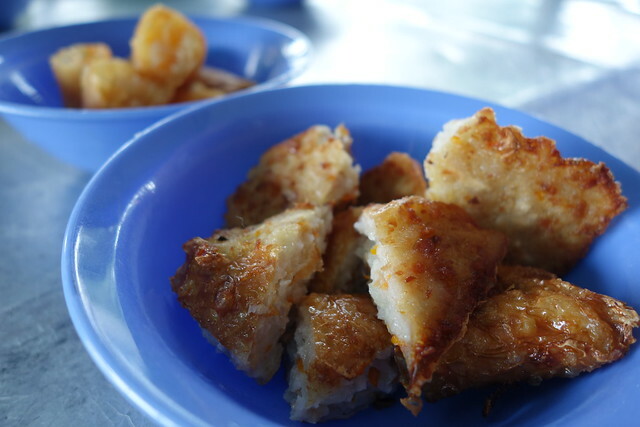 Although I loved the crisp bean curd skin, I wasn't crazy about the bland and floury-tasting filling. Even dunking it into the broth did little to help lift the flavours. Sold at the same price as the Spring Rolls, I think I shall order more Poh Piah and give the Kwan Jiang a miss the next time I visit. Look for a modified lorry parked behind Jelutong Post Office. 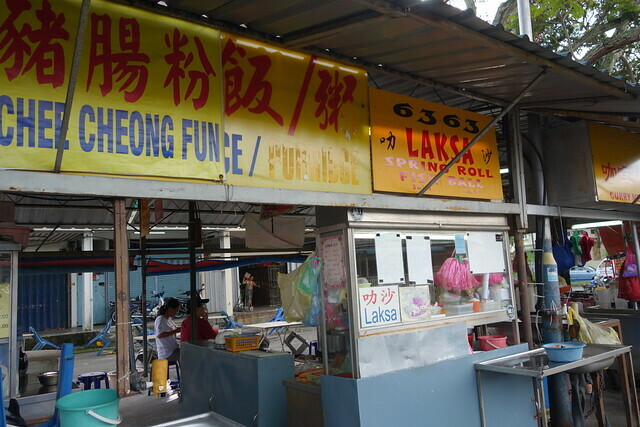 Whilst making our way to the main road to get a cab, we decided to make a pit stop at the hawker centre at the intersection of Lebuhraya Jelutong (Jelutong Expressway) and Lorong Ipoh to try some of the food. This bowl of Penang Laksa was the prettiest of the four we had and I loved how generous they were with sliced green chili padi, pineapple chunks, mint leaves and diced ginger flower. Though the fish broth used in this bowl was slightly less flavourful than the one sold from the food truck, this is nonetheless a pretty tasty bowl of Penang Laksa with a good balance of herbs, spices and sourish assam. Worth a try if you're in the area. Most of the shops in the area and many of the stalls in the hawker centre were closed when we were there that Friday afternoon. I wonder if this hawker centre is most busy in the morning or in the evening. 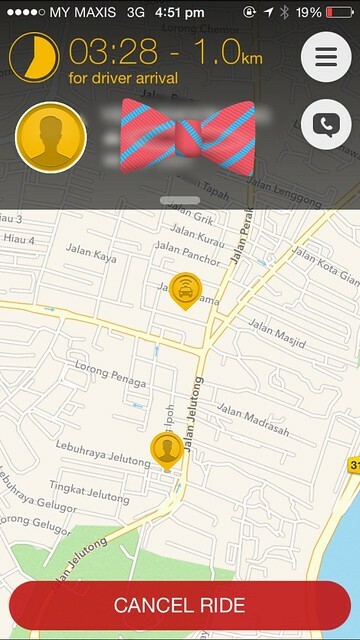 We had a hard time trying to find a cab from Jelutong as there weren't any cabs in the area. Finally, out of desperation as we had a plane to catch and some souvenirs to pick up before that, I tried Easy Taxi and found a cab within minutes. I love third-party taxi booking apps as they've been invaluable in Singapore where the official booking channels are often ineffective, especially on rainy days. I'm thrilled to share that they work fairly well in Malaysia too. It was pure luck to have a cab pretty close to us and who was willing to take our booking. Even though our driver told us that the adoption rate is still pretty low in Penang, I think this app is still worth a try for tourists in Penang. After days of getting fleeced by many cab drivers (in red cabs that are plentiful but near impossible to get a ride without paying through your nose) who refused to switch on the meter and charged us exorbitant rates for very short taxi rides, I hope third-party booking apps such as Easy Taxi will take off without a hitch in Penang. If you're lucky, you'd be able to flag a blue cab with meters that are actually switched on however, they are few and very far between. Even though I love the food in Penang, I hate being fleeced by cabbies and having to haggle but still settle for exorbitant prices. This bad experience with transportation is enough to deter me from wanting to visit Penang often. Indicative quotes for booking a cab for 4 hour slots is akin to the rates for getting a private car in Bali for an entire day! I'm not surprised that many foreign blogs have said that Malaysian taxi drivers have been dubbed the worst in the world. 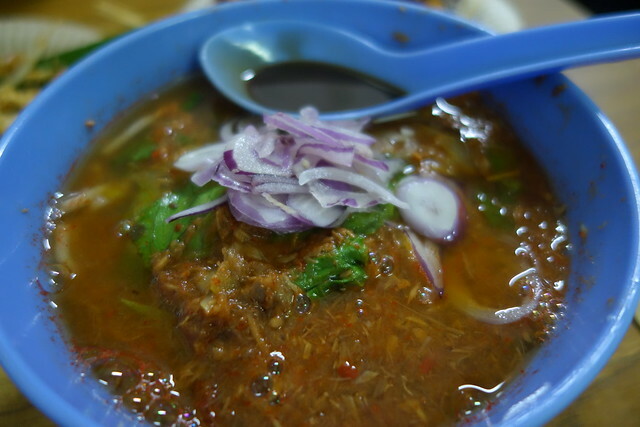 After this trip to Penang, I'm inspired to dust off my recipe book and make my own Penang Assam Laksa at home again. Just need to find some time during a less busy and tiring period.